Traditionally the junior service, operating in the Army’s shadow and receiving a ten percent share of the 2015 defence budget of $6.6 billion, Pakistan’s Navy personnel numbers more than 22,000 active, plus 5,000 in the reserve. This secondary role stands in contrast with the economy’s dependence on the sea, with the port city of Karachi contributing 25 percent of GDP and the proposed China Pakistan Economic Corridor (CPEC) raising the country’s maritime profile even further. Much of the Navy’s backbone, including its seven submarines, five French-made ‘Khalid’ class conventional hunter-killer (SSKs) acquired in the 1990s plus two ‘Hashmat’ class SSKs from the 1970s, is nearing retirement. The Navy is working to acquire new surface and undersea combatants, boosting domestic shipbuilding in the process and in cooperation with Beijing. Plans include procuring an additional four 3000-ton F-22P/’Zulfiqar’ (Sword) class frigates with improved sensors and weapons (including HQ-17 surface-to-air missiles, developed from Russia’s Tor 1/SA-N-9), as well as six Type-022 Houbei stealth catamaran missile boats. State-owned shipbuilder Karachi Shipyard and Engineering Works (KSEW) is responsible for these programs, and is expanding its facilities with a new foundry, manufacturing areas, and two dry docks of 26,000 and 18,000 dead weight tons, spread over 71 acres. Islamabad had been hoping to procure six Perry-class frigates from the US on easy terms, but congressional hostility has prompted greater reliance on China, a country heavily committed at all levels to Pakistan, being a key to Beijing’s strategy of securing access to the Indian Ocean and keeping New Delhi distracted by a regional rival. 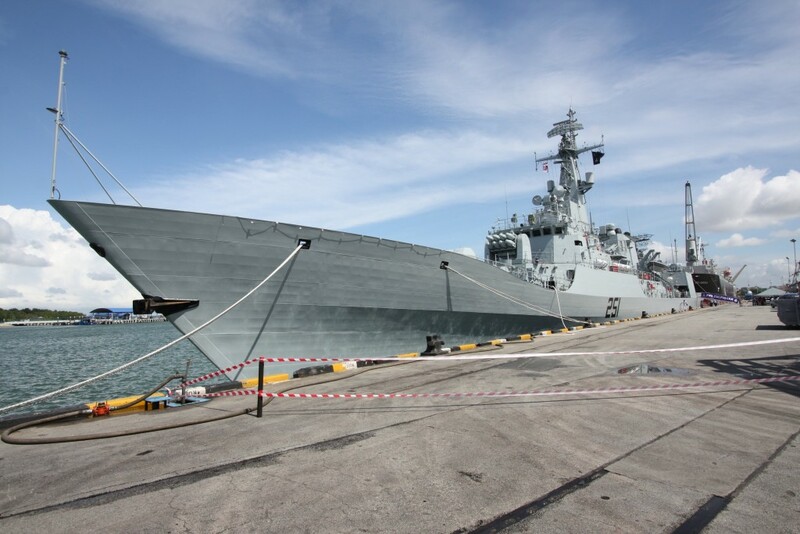 Sword class frigate of the Pakistani Navy. 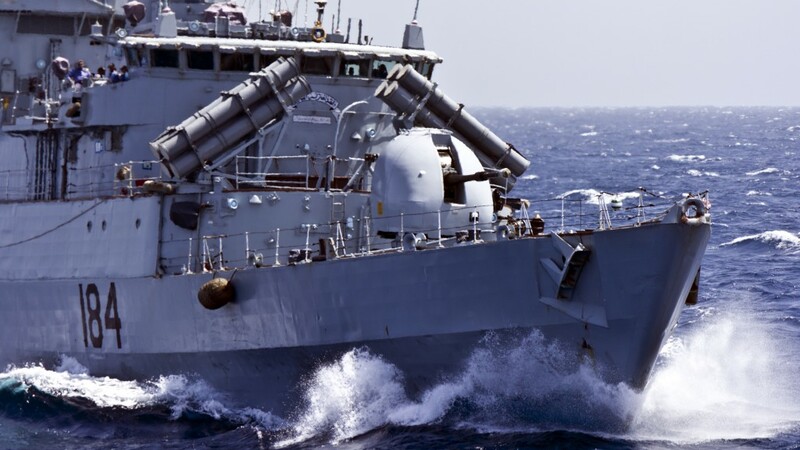 PNS Badr, a British-built Type-21 frigate, was decommissioned in 2014. 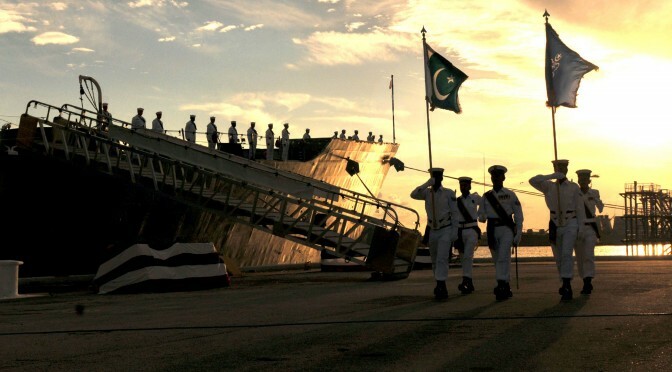 Despite being the junior service and the country facing a difficult fiscal position, Pakistan’s Navy has been pushing for ambitious plans in terms of both surface and undersea combatants. Source Flickr. While new ships are seen as essential in terms of maritime security and the fight against piracy, it is Pakistani plans to acquire new submarines that have met with the greatest concern in New Delhi. In March 2015, Islamabad announced plans to procure eight new Chinese submarines, and in October 2015 confirmed that four would be purchased from Beijing and four built at KSEW. The package includes a training centre in Karachi and probably includes access to China’s Beidou-II (BDS-2) satellite navigation network. 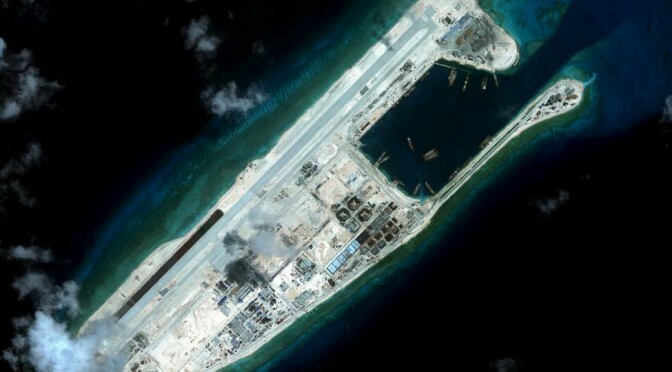 Thanks to similar designs, Beijing, in turn, gets to enjoy the necessary maintenance personnel and facilities enabling her to operate her own submarines much more efficiently in the Indian Ocean, home to vital SLOCs (sea lanes of communication) for China. 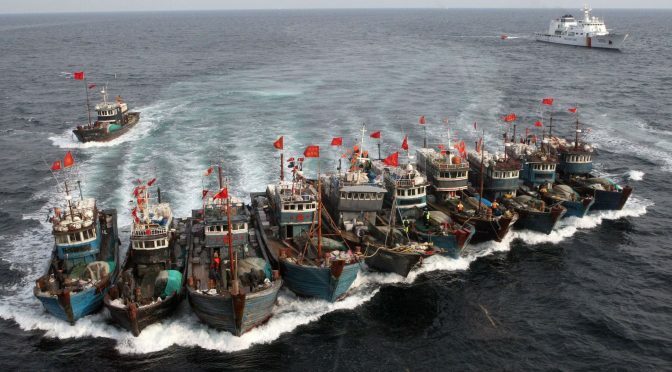 Ideally the Navy would like a total of 12 new boats. These Chinese-designed submarines will probably be based on the air independent propulsion (AIP) equipped Type 39B Yuan SSK (known as S-20 in its export version). Displacing 2,300 tons, they can fire both cruise missiles and 533 mm torpedoes, and can also deploy mines and special forces. Pakistan, already working on a version of the National Defence Complex Babur missile capable of launch from her old Khalid submarines, sees the S-20 as more than a conventional platform, although preventing an Indian blockade is certainly a major goal in and by itself. A sea-based deterrent would provide Islamabad with a second strike capability, while avoiding perceptions of falling behind India in the nuclear sphere. The resulting improvement in survivability is seen by Mansoor Ahmed (Stanton Nuclear Security junior faculty fellow at the Harvard Kennedy School’s Belfer Center), as providing greater strategic stability to South Asia, given that India could not be sure of completely destroying Pakistani nuclear forces and thus escape unacceptable damage herself. Alex Calvo is a guest professor at Nagoya University (Japan) focusing on security and defence policy, international law, and military history in the Indian-Pacific Ocean Region. 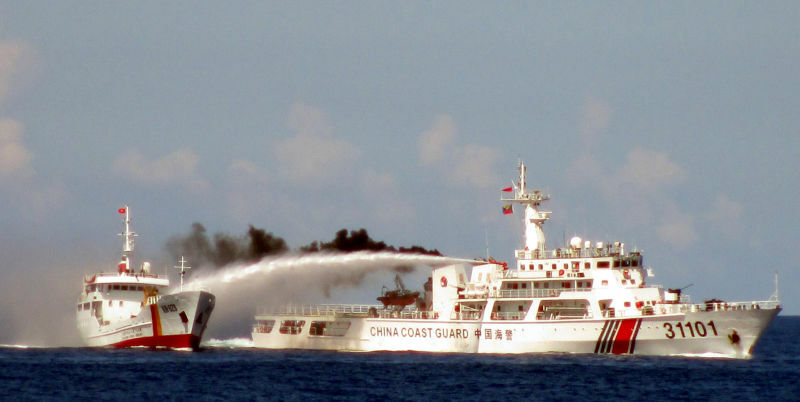 A member of the Center for International Maritime Security (CIMSEC) and Taiwan’s South China Sea Think-Tank, he is currently writing a book about Asia’s role and contribution to the Allied victory in the Great War. He tweets @Alex__Calvo and his work can be found here. Featured Image: MAYPORT, Fla. (Aug. 31, 2010) Pakistan sailors parade their country’s colors during the decommissioning ceremony of the guided-missile frigate USS McInerney (FFG 8) at Naval Station Mayport. During the ceremony, McInerney was commissioned into the Pakistan navy as PNS Alamgir (F 260). (U.S. Navy photo by Mass Communication Specialist 2nd Class Gary Granger Jr./Released). Tom Ricks is no stranger. If you follow the US military, then you’ve probably stopped by his blog “The Best Defense” over at Foreign Policy magazine on more than one occasion. Sometimes provocative, always interesting, Ricks has provided a voice for civilians, officers, and enlisted, to raise issues, debate defense policies, or often recommend a good book. In fact, Ricks’ comments on books and reading lists have fed my intellectual curiosity these past few years. 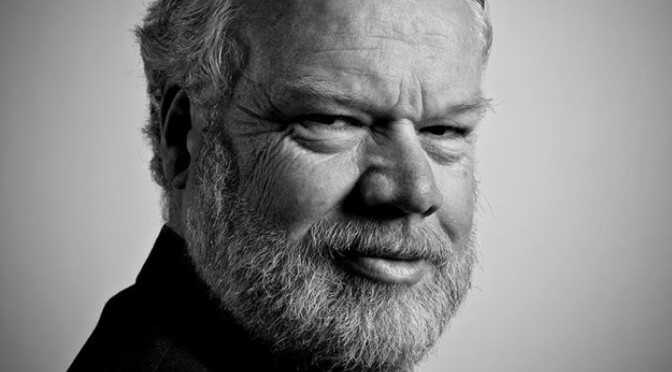 Tom Ricks joined me to talk about everything from the craft of writing, the size of his library, to one of his favorite books at the moment, a book on military innovation. What got you started in journalism and why cover the military? What got me started in journalism was I was living in Hong Kong and teaching English and English literature. I always expected to be a teacher. And I saw, when I was about twenty-two years old in Hong Kong, the people that were enjoying themselves were journalists — the young American, British, and Chinese journalists. I couldn’t believe that some adult would give them a credit card and just allow them to go around and ask people questions. It seemed like a good gig to me. Also, once I began in journalism, I found that the military really interested me. It was a interesting institution in of itself. You could write about everything from politics to international relations to technology — the basic human stories. And then I found in about 1995 when I was working on what became Making the Corps, it was also a very good way of looking at America; and looking at where our country is by talking to young recruits and so on. So I found out that I really enjoyed covering the military as well. What were your favorite books of 2015? Your top three? And why? It’s funny, I don’t really read books as they come out. I read books as they happen to provoke my interest. I think my favorite nonfiction book that I read last year was about the Comanches. It’s called The Comanche Empire, by Pekka Hämäläinen. In fiction, I really like Elizabeth Strout. I’d read her book Olive Kitteridge, so recently I went back and read an earlier novel of hers called Abide With Me. I read it in particular because it is about winter in Maine, which is six months long, and which I am living through, so her bringing a novelist’s eye to it really intrigued me. So those are sort of the two books that really struck me lately. One other: I also finally got around to reading The Liar’s Club by Mary Karr. It’s just a wonderfully written memoir about growing up in Southeast Texas near Port Arthur, near Houston in the 1960s. Her style reminds me of Mark Twain, one of my favorite authors. Professionally, oddly enough, the book that has struck me is one that I read twenty years ago and I picked it up again recently. I liked it then—and re-reading it, I loved it. I wrote about it in the blog, it is by Stephen Peter Rosen, and its called Winning the Next War. It’s about military innovation, what works and what doesn’t. A lot of it is counter intuitive. Money is not important to innovation, in fact it may hurt it; technology is not that important to innovation; what is really important to innovation is organizational change during peacetime. It really is a very different take, and I find it intriguing because I think it is a crucial issue. I worry that we have a big late Industrial Age military, which is a problem because we are on the cusp of Information Age. We confuse the ability to throw firepower with the ability to subdue an enemy. In that way today’s US military reminds me of the Royal Navy of 1939. The Royal Navy then was the biggest in the world, it had the most battleships and the ability to throw more firepower, but was almost entirely irrelevant in World War II. They neglected changes; they didn’t understand the submarine; they didn’t understand how to use the aircraft carrier; and they didn’t have enough destroyers. They won the Battle of the Atlantic but that was with us giving them a lot of destroyers and other help, like providing submarine support. Is there a book that is coming out that you are looking forward to? The new book that struck me most recently was a graphic novel — and I am not a big fan of those. 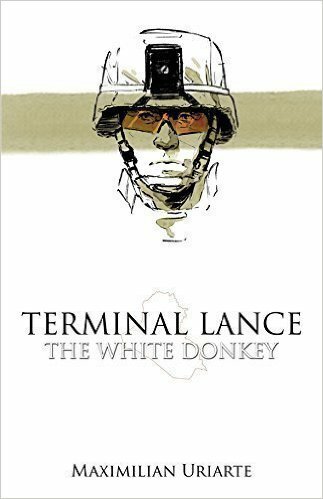 It is by the guy who does Terminal Lance. It’s called The White Donkey. It is a graphic novel about his time in Iraq. It was self-published but now it is coming out by Little Brown, the big publisher, in April. I am looking forward to see how well it does when it comes out. What is your daily routine? As a writer, do you block off time each day to write? I’m definitely a morning writer. I like to get up, make a cup of coffee, and sit down and start writing. I get the blog out pretty quickly, and then I turn to whatever book I am writing at the time. I usually try to do about four hours a day, stopping around lunchtime. I’ll have lunch with my wife, and then in the afternoon do some errands, maybe take a walk, and then sit down to read or do some research. I find that when I am too tired to write I like turn to research. And for me, the lesson in book writing is to stop when you start feeling tired. It really takes your full energy and full attention the way research doesn’t. That sounds like pretty good advice to anyone who wants to write. My advice is to establish a routine—that is, do not wait for inspiration. Writing is a lot more like carpentry than it is like poetry. It’s a craft. You have to get up and saw and sand and screw things together, and then stand back and look at it. Sometimes you’ll say, “OK, that didn’t quite work, let me rework it.” Sometimes it does work. But the people who tell me, “I’m writing a book on the weekends”—when they say that, well, I think to myself, no, you’re enjoying yourself and pretending to write a book on the weekends. The only way a book gets written if you really work on it every day. Every morning, for me. Do you read with a pencil in hand? Is a notebook close by? Do you do a lot of marginalia when reading? Totally. To me that is intellectual capital — the marginalia in any book. I remember a professor of mine in college who said, “If you are not reading with a pen in your hand then you are not reading.” I find that is especially true for nonfiction. I’m constantly taking notes. In fact, one measure for me is that how much I’ve learned from a book is the number of pages I’ve marked up. In Winning the Next War by Peter Rosen, which I just re-read, I probably took ten pages of notes the second time I read it — even more notes than I did the first time. Filling up the front and the back of the book with notes and thoughts and connections. And for me that will often become the grist for a blog item or even for something that I’m writing about in a book. If you had the chance to invite three authors over to your house for dinner — living or dead — who is coming to your house, and why? My favorite historian is David Hackett Fisher. I think I’ve read all his books. I love Washington’s Crossing. I read his Albion’s Seed twice, and Paul Revere’s Ride, also by him, which is just lovely. I’ve never met him. I would enjoy meeting him and asking him what he thinks about books. I would love to see him write about the Civil War. He’s written about almost every other aspect of American History. I think he is my favorite American historian, and it seems to me that the Civil War is the essential event of our history. I would love to see him tackle that. Another favorite writer of mine is actually a friend of mine, Eliot Cohen, who has written several terrific books. My favorite book by him is called Supreme Command. It’s how really good civilian leaders lead their militaries. One of the themes of this book is that they are not hands off, and they are not looking for consensus. Instead, they are constantly probing and asking questions, pushing their military leaders. They are especially looking to surface differences. To say, “now you guys disagreed on this, now tell me about this disagreement.” You see this in leaders like Churchill and Franklin Roosevelt, and actually Dwight Eisenhower as well. For a third one, let’s see, I’ve read almost all the novels by Jonathan Franzen. I think he is a lovely writer. But I also think he is a crank and curmudgeon. I’m not sure I would enjoy dinner with him, but it would sure be interesting to have dinner with him. How many books do you have in your library? It’s funny you should ask, because where we live in Maine, we finally have a really good basement, big and dry. So for the first time in my life I have been able to get all of my books in one spot, and I really like that. They’re on long boards and cinderblocks. I measure it by the foot. I actually wrote about this in the blog once. The biggest section is World War II, which I think is thirty-two feet. And there probably are seven and a bit shelves of Iraq, which going by the boards I used makes about 31 feet. And then there is 27 feet of Vietnam, 9 of the Korean War. Unfortunately the basement is filling up fast. So you’ve been covering the US military for over twenty years. I’m curious about your readers. You’ve been blogging over at Foreign Policy for some time. Yet you don’t talk about your readers much. I’m curious about how many people stop by “Best Defense”? What types of readers are reading ‘Best Defense’? I don’t know on the numbers, partly because Foreign Policy’s editors keep the numbers close hold. When I ask them about the numbers I get gobbledygook about unique hits, and you know, “push only visitors” and “unique visitors,” and all that stuff. It doesn’t tell me anything. A few years ago, I believe I was told I was getting 30,000 to 40,000 readers a month. But that could be wildly wrong. I never really pushed the issue with my editors. Maybe they are afraid that if they tell me how many visitors I have, that I’ll ask for a raise. Now, the types of readers I have, I’m better on. Start with a big military audience. I’d have to say concentrated on middle NCO’s and junior and middle officers with a smattering of younger enlisted and a smattering of O6 and above. That’s in the military. The second big group is academics. And military history is a pretty lonely field, so academics seem to like a place that welcomes military historians. The third group is defense journalists, think tank people, guys at corporations in northern Virginia, things like that. It kind of amuses my wife—she says that within three miles of the Pentagon, I’m a minor celebrity. Beyond that I’m totally anonymous and very happy with that. You’ve probably been to more than a few archives. What is the most interesting thing you’ve read or discovered? There are a lot of exciting things in the archives. It just amazes me that you can sit there and if you ask for the right files and explain what you are looking for, and the people in the archives that work there tend to be very helpful, you can sit and hold maps that guys held on the beaches on D-Day. The original maps that have their markings on them, the markings they are making in pencil as they figure out where a German machine gun nest is, or where the lines of communications are. But I gotta say, the single most moving thing I ever found were some letters by a general, Terry de la Mesa Allen, who was commander of the 1st Infantry Division in Sicily in August, 1943; a very good division commander, a very tough fighter. Terry Allen was relived of division command by Omar Bradley. It was very public and he didn’t know why. He had just won the key battle of the campaign in central Sicily and then he got fired, along with his assistant division commander, who was Teddy Roosevelt, Jr., the son of the President. He writes back to his wife a series of letters in pencil on blue lined school notebook paper. And one day he writes to his wife, “Patton dropped by, Patton thinks I’m being promoted to something.” Which is totally BS. And I think Patton knew it. Eventually Allen gets sent back to America without a job. George Marshall, the Army chief, admired Allen even though Allen was a very heavy drinker. When Marshall found out that Allen had been fired by Bradley, I found in the archives a note Marshall wrote to an aide that said: “Give Allen another division that is going overseas. Give him the 82nd if that is next to go over.” And when Marshall was told the 82nd was not the next, Marshall said: “Give him the next division that comes up.” So a year later Marshall has Terry Allen back in Europe commanding the 104th Infantry Division. To hold that series of letters where Allen is trying to figure out what is going on, in the midst of just having played a central role in the first American campaign against the Germans on European soil, is just amazing to me. That really was a heart stopping thing for me when doing research. Still, I have to mention that one of the hazards I didn’t know about when doing research, is that I’ll be sitting there in the Army archives, reading these things in Carlisle, Pennsylvania, and frequently I’ll go back to my hotel room and at night I’d begin hacking, and I’d realize that I’d ingested a lot of dust looking at files that people that hadn’t looked at for years and years. If I go again I think I will wear a mask next time. What books would you recommend to the next US President? The next Secretary of Defense? The next Joint Chiefs of Staff? I would recommend to all of them Cohen’s Supreme Command. For my money it is the best book about how the civilian leadership should run his military, and how military leaders should deal with their civilian overseers. It’s also about strategy. Strategy is not easy. If you are not crying than you are not making strategy. If you are not asking hard questions you are not making strategy. If you are not prioritizing between the important and the essential, you are not making strategy. Eliot Cohen’s book brings those points home and does it very well by examining a series of leaders and their decisions. You are very good about not pushing your favorite articles on your blog. And at the end of the year you often run a top 20 most read articles. But I’m curious what are some of your favorite articles from guest authors? You’re right, I try not push things, because I often run things I disagree with. Frequently an article will come out and I will make a comment, and then somebody reads it and writes me and says: “Sir, I am a big fan of your blog, but let me tell you why you are dead wrong.”And frequently I will write back and say, “that sounds interesting, why don’t you write it up into an article.” So a lot of articles come out of disagreements with me, or perhaps email exchanges. As to favorite, I have two types. There is a special place in my heart for the pieces by the enlisted military personnel. I think officers have too large a voice in policy formulation, and that the enlisted have too small a voice, especially given their numbers. We have a very well educated, professional enlisted military these days. I don’t think we take sufficient notice of that or make sufficient use of it. So one of the things I try to do in the blog is I have this group called the “Council of Former Enlisted.” These are people who have been in the military but are now out, so they can speak freely. They are thinking about their experience. Many of them are in college, some of them are in grad school. And that council of the former enlisted I have really enjoyed. One of them in particular, Sebastian Bae, a former Marine sergeant has written a bunch of really good articles that I like. I also want to mention another guy, Ryan Blum, who wrote a good article about living in Paris the past year. He said he went to Paris to get away from the war, but he found out with the terror attacks there in November that it followed him there. Another article that is a favorite of mine is one that was published recently. It’s by a ninety-one-year-old Marine veteran of World War II. He writes about the country he knew as a child, the country he fought for during World War II. He ends up with a very gloomy conclusion. He says because of the income inequalities in this country these days, he thinks this country is not living up to the sacrifices he and his buddies made in World War II. We were fighting for a country of fairness and sharing, relative equality and income, he says, and now we don’t have that. The rich are much too rich in this country nowadays. A lot of people are struggling to get by, even with two incomes. He said that’s not the country I knew, that’s not the country I fought for. By having that country now, he concludes, we are not honoring the sacrifice of people who fought in World War II. I understand you are working on a book on Orwell and Churchill? Can you tell us about your next project? What fascinates you about Orwell and Churchill? Orwell and Churchill came to me oddly. The commonality is that in their youth they were both war correspondents. And so I came to them as a war correspondent myself. I actually did a staff ride in Spain with Eliot Cohen which I played the character of George Orwell. At times you’ve been critical about military periodicals, and at other times you’ve praised some of the pieces in these periodicals. What would you do if you were the editor to make some of these periodicals better? I look back to certain periodicals have good spells — times they should emulate. They shouldn’t do what Tom Ricks says, they should just do their best to be at their best. For example, Army Magazine I think is going through a very good spell and has for the last couple of years, and that’s changed—I mean, it used to be the dullest of military periodicals. Marine Corps Gazette in the 1980s and early 1990s was very powerful — it stood head and shoulders above the other military publications. And then I think it has been whipped around by the Commandants too much and kind of lost a lot of its bite that it used to have; it used to have really serious intellectual discussions — you just don’t really see that so much anymore. Likewise, Proceedings used to be very strong but really seems to me to be too focused on what’s going through Admirals’ minds these days. It’s run some absolutely fatuous pieces by admirals that just do not do it credit. So I think Proceedings has fallen down in recent years. And the Air Force, well, I see very little good writing coming out of it. Decision time. Would you rather have Orwell’s Why I Write or Zinsser’s On Writing Well on your desk? Here are the two things I recommend to anybody trying to write: One is Orwell’s essay “Politics and the English Language.” It’s one of the best things written about the writing and about thinking. The other is E.B. White’s book The Elements of Style. I actually tried to propose a rule policy at think tanks that I have worked at, which is that every intern must read this book and take a quiz on it before they start working here. I spent a lot of time working at think tanks, editing interns and translating their writing into English. And it’s not just interns, it’s also a lot of officers. Everybody who is trying to write for other people should read E.B. White’s Elements of Style. It’s short enough that you can read it in one night. Tom Ricks, thank you so much for you joining us. All the best to you. You are welcome. I enjoyed it. Thomas Ricks is senior advisor for national security at the New America Foundation. He also is a contributing editor of Foreign Policy magazine, for which he writes the blog “The Best Defense,” which was named the best blog of the year by the American Society of Magazine Editors in 2010, as well as the best military blog by Military Reporters & Editors. He is currently writing a study of the roles Winston Churchill and George Orwell played in shaping politics and culture of the 20th century. He is the author of Fiasco: The American Military Adventure in Iraq, 2003-05, which was a no. 1 New York Times bestseller and a finalist for the Pulitzer Prize in 2007. His second book on that war, The Gamble: General Petraeus and the American Military Adventure in Iraq, 2006-08, was published in 2009. He also wrote Making the Corps, which won the Washington Monthly’s “Political Book of the Year” award. His first novel, A Soldier’s Duty, about the U.S. military intervening in Afghanistan, was published by Random House in June 2001–some four months before the U.S. actually did intervene there. He also has written on defense matters for the Atlantic Monthly and other publications. His most recent book is The Generals: American Military Command from World War II to Today. Born in Massachusetts in 1955, he grew up in New York and Afghanistan and graduated from Yale in 1977. He is married to Mary Catherine Ricks, author of Escape on the Pearl, a history of one of the biggest slave escapes in American history. They have two grown children. For recreation he enjoys sailing, hiking, sea kayaking, downhill skiing and reading military history. Lieutenant Commander Christopher Nelson, USN, is an intelligence officer stationed at the US Pacific Fleet Headquarters in Honolulu, Hawaii. Lieutenant Commander Nelson is a graduate of the US Naval War College and the navy’s operational planning school, the Maritime Advanced Warfighting School in Newport, Rhode Island. The comments and questions above are the author’s own and do not necessarily reflect those of the US Department of Defense or the US Navy.